When The Lakewood BlueClaws players are not on the baseball field, they like to be on the golf course. The players were happy to share their love of the game with their youngest fans at Eagle Ridge Golf Club. It was a great afternoon as Eagle Ridge golf pros and BlueClaws baseball players came together to show how golf and baseball are very similar in some ways and different in others. 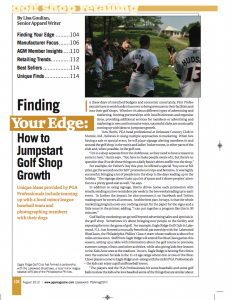 PGA Magazine took a closer a look at this collaboration.